As a New England resident, you’re no doubt familiar with the “S” word… snow! All that snow we get in the winter don’t just pile on the streets and in your driveway—it accumulates on your roof, gutters, and gutter screen. In Acton, MA, this can lead to a huge problem: ice damming. Ice dams can trap water on your roof until it seeps into your attic and down your walls, causing serious water damage to your home. Ice dams also cause icicles to form on the edge of your gutters, which is a huge liability for you, your family, and any guests. So, what can you do to stop ice damming? Sometimes the problem can be cured by additional insulation in your attic, or possibly more ventilation. But that’s not always practical (or cheap). In these cases, heat wires are your best bet. Heat wires are your home’s best friend in the winter. They melt a path for water run-off all the way through your gutter screen system, preventing water back up and icicles. Heat wires are inexpensive because they can be installed only on the areas of your roof/gutters that are directly above the foot traffic areas of your home. If the only place people enter your home is through the front door, then you’ll need only a few feet of heat wire. Another great feature about heat wires is that many are self-regulating and will adjust according to outside temperatures. You never have to mess with manually controlling the output levels. Once it’s installed, you don’t have to worry about it again. Easy-peasy. If you’re looking for gutter screens in Acton, MA, strongly consider getting heat wires at the same time. Since you install them only where you need them, they are super affordable and practical. 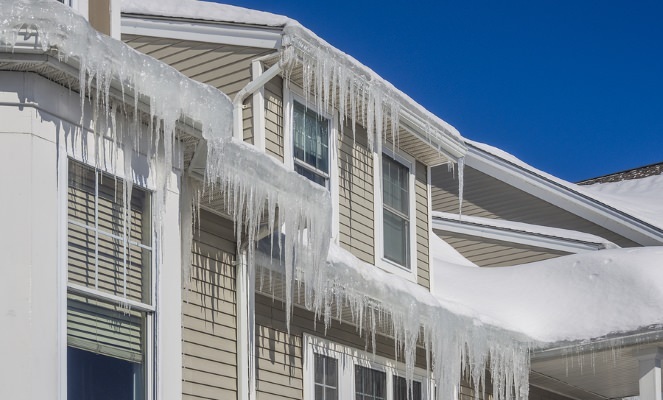 You’ll prevent ice dams from damaging your home… and protect yourself from a falling icicle to the eye. Want to know more about heat wires, gutters, and gutter screens for Acton, MA? Click here to visit our website, and check out our Heat Wires page. We’re experts in all things gutter, and we can provide you with the information you need to make the best decision for your home and budget.